Ki&apos;s was started as a simple idea in a small converted beauty shop in Cardiff-by-the-Sea. In 1980 Catherine "Ki" Holcomb partnered with her son, Barry, to provide the local community fresh juice and vitamins. Shortly after, Ki started cooking home style meals prepared in a healthful manner. The meals were a hit and the popularity of Ki&apos;s grew steadily. In 1994, to facilitate ever-growing popularity, Ki&apos;s moved from its original location to a two-story, ocean view home on South Coast Highway 101 where it resides today. From the Coast Highway location, Ki&apos;s has expanded by adding wholesale and catering businesses. Ki&apos;s salads, dressings, salsas and baked goods have become popular throughout Southern California, and the catering business has provided great food for family, social and business events in the local communities since 1997. Ki&apos;s has been privately owned by the Holcomb family since its inception. Besides continuing to grow the business and foster customer loyalty, the Holcomb family has looked to enrich the community by providing nutritious, great tasting food. Hopefully you will enjoy the Ki&apos;s experience with your friends and family in the years to come! It is our goal to maintain a quality, customer-focused business by serving great tasting and nutritious food in a friendly and comfortable style. Every customer is special at Ki&apos;s.
Ki&apos;s is a perfect fit for its local beach community culture. We provide food options that serve the needs of people who actively enjoy the outdoors and have a high degree of awareness for their health, fitness and well being. And Ki&apos;s is more than just a &apos;health food&apos; option for many. It is simply great food for anyone-professionals on-the-go, families looking for a home-cooked meal or friends hanging out enjoying some tasty eats. Ki&apos;s approaches business with awareness of the environment. It recycles as much as possible. Ki&apos;s ongoing plan is to regularly integrate environmentally friendly actions into its day-to-day business. Long ago (well at least over a decade ago) Ki&apos;s became a pioneering user of the now pervasive biodegradable brown napkin. These days, Ki&apos;s is moving toward containers that can be composted. During our last remodel, we focused on natural and sustainable materials. Please enjoy the eco-friendly hickory floor in the dining room, the glass mosaic made from recycled bottle glass behind the order counter and along side the upstairs bar, and the multi- colored slate covering the entire downstairs. The purple clay plaster featured in the entry way is also a natural product, deriving its color from natural earth pigmentation. Ki&apos;s also supports local organizations that promote environmental awareness such as the San Elijo Lagoon Conservancy. 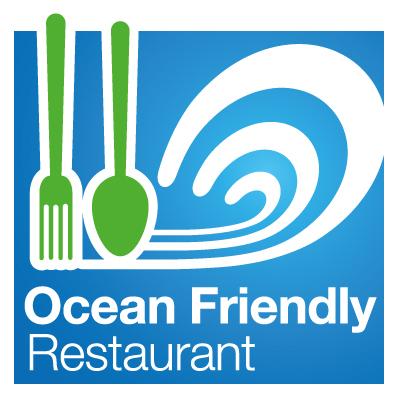 As well- we are very proud to be have become certified by the Surfrider Foundation as an Ocean Friendly Restaurant!